What Day Of The Week Was February 11, 1937? 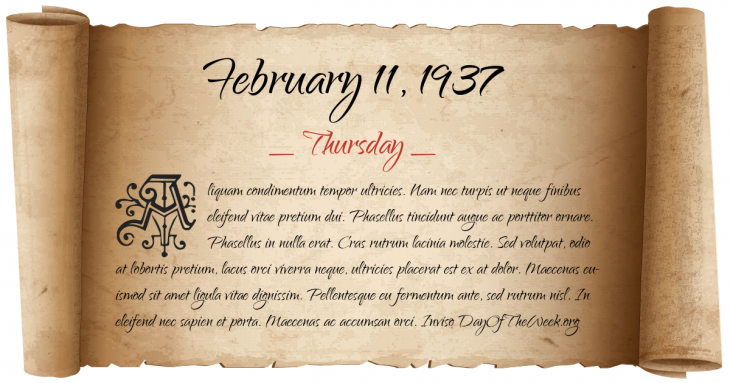 February 11, 1937 was the 42nd day of the year 1937 in the Gregorian calendar. There were 323 days remaining until the end of the year. The day of the week was Thursday. A person born on this day will be 82 years old today. If that same person saved a Half dollar every day starting at age 3, then by now that person has accumulated $14,461.50 today. A sit-down strike ends when General Motors recognizes the United Auto Workers Union. New Year’s Day in Chinese calendar. Start of the year of the Fire Ox in Chinese astrology. Who were born on February 11, 1937?